For quite a few years now I’ve been creating a seasonal desktop calendar for my Stamper’s Club and a private stamping group. Since both groups meet at the beginning of the month that is usually our first class when we start a new year. This calendar is different from the ones most people make – which is just a stand with rip off calendar for each month of the year. My Seasonal Calendar has four panels – one for each quarter/season of the year and allows you to view multiple months at a time for planning and scheduling. My ladies love to have these on their desk at work so I continue to make one each year for them. Each panel is built on a square with the calendar strip on the right side and a decorative seasonal element on the left side. Then all the squares are attached to a base piece and held up on the desk with a little stand. On Sunday, January 13, 2019 I did a Facebook Live video on my business page – At Monika’s Place – showing exactly how I made this whole project. It’s much easier to show it than to describe it in words. I had planned to upload to my Youtube Channel as well but I haven’t quite figured out how to get it there from my FB page. On this 1st quarter panel I used the Stamparatus for positioning my stamps. The little image for the ground under my trees was done using the hinge-step technique. The small grid paper is also helpful for positioning the card stock on the stamparatus – I marked alignment positions on the paper so everyone could use the stamps as I had them arranged on the stamparatus. For this second quarter panel I used the Butterfly Duet punch to punch out the butterflies from the designer paper. If you watch the video I’ll show you a handy trick for getting these lined up in your punch. For this third quarter panel I used the Pool Party & Silver Baker’s Twine – which is three strands twisted together – one Pool Party, one Whisper White and one Silver. I slightly twisted one end to separate them and then pulled out just the Pool Party piece to use on the panel. You can see how to do this in the video. You could use the white or the white and the silver twisted piece on the 1st quarter panel. On this 4th panel I used a Stampin’ Sponge to ink up the wood slice image to make it a little lighter than a full on inking of it. And I also used the sponge to add a bit of ink around in the background. On each panel I added the calendar strip. These were created in the old My Digital Studio program. I still have it saved on my old laptop. In the program I exported the calendar images and then printed them on my printer here at home. I used Whisper White card stock for my printing. I’ve added the images here. If you save them to your computer then select them both to print as 5×7 photos on one sheet. Make sure that the box for Fit Picture to Frame is not selected. Once you print them I trim them to 5-3/4″ long and 2″ wide. You may need to adjust the printing on your printer to get them to the right size. Once all four panels are made I attach them to the base piece which was 12″ x 6″ Early Espresso card stock. And the little stand piece is 5-1/2″ x 2-1/8″ and scored at 1-3/4″ & 3-3/4″. When attaching each panel to the base use Stampin’ Dimensionals on the sides and across the top but don’t place one in the center of the bottom. That needs to stay open to slide the stand piece in for holding the calendar upright on your desk. I hope you enjoy this project. Be sure to visit my FB page to watch the video and while you are there like/get notifications for my page so you’ll see future videos and post. I’d love to hear what you think. You can order the products I used to make this project by clicking the link below. Thanks so much for visiting! Summer is quickly coming to an end which hopefully means our temperatures will cool down. It’s been hot and in 10 days I’m going to be walking 30 miles for the Georgia 2 Day Breast Cancer Walk and really want the temps to cool down. It is not fun walking when its 90 degrees outside. By the way if you would like to donate to my walk you can sponsor me here on my walker fundraising page. So did you have any amazing adventures this summer or maybe for fall break. The schools around here are on fall break this week and many of my neighbors are at the beach one more time. In my Stamper’s Club we have been making a scrapbook page every month and for September I created this fun Amazing Adventure Page for them. I wonder what amazing adventure photos everyone will add to this page. What would you put on here? 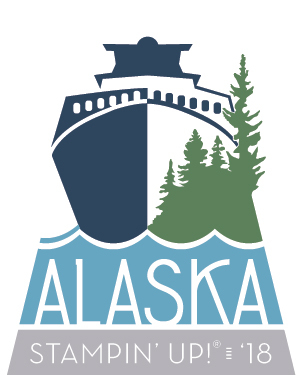 My summer adventure included a whale watching trip in Alaska and that’s likely what I will be adding to this page. You can order the supplies needed to make this page by visiting my online store. Here are a couple of close up photos of the details. The netting and seaweed are stamped on the white background. I used my Stamparatus to stamp the Octupus. Creating a template and then blanks so that everyone could easily line up the stamping. I was able to ink and stamp a couple of times to make sure he was really dark. It was like an octo-puzzle! Order supplies online here – use hostess code SCH7WNEU for September 2018. I was so excited to see the Little Elephant stamp set and punch in the Stampin’ Up! catalog. I’ve been collecting elephants since I was a little girl and always get the sets that have an elephant. 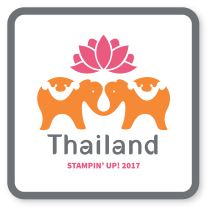 When I was in school I hand carved an elephant stamp – I guess that was probably my first stamping experience! I didn’t know then that I would be doing this all the time now. Here is the first thing I made with the I created with the Little Elephant stamp set and punch. It was one of my August Stamp Club projects. We are having a lot of fun in stamp club each month. All members get to make a 3D project, a card that usually features a technique and a scrapbook page. I’ve really enjoyed getting back to making scrapbook pages. Here is a closer look at this month’s Little Elephant box. The little flowers are stamped around the base of the box in the Soft Sea Foam ink. Use the Elephant Builder punch to punch strips of the Twinkle Twinkle Designer paper – the big and little ears are what I used for the flowers. Glue them to the box on top of the stamped flowers. Use a piece of the Designer Series Paper and wrap it around the box – but don’t glue it – just tie the twine around it – that way you can untie the twine and remove the wrap to open the box. It’s perfect little gift for a new baby – you could roll up a little onsies or some socks to stick inside! Remember it’s Bonus Days for the month of August – every $50 order will earn a Bonus Coupon that you can use on an order in September!